Operative Experience provided HealthySim a special look at the RealMom birthing simulator in action at the IMSH 2018 event, showcasing realistic skin delivery with little hardware changes between births required. We were surprised to see how quickly the newborn could be reloaded into RealMom, which took less than a minute to re setup after the live birth demonstration. This, combined with the extremely realistic skins and texture feeling of the manikins makes RealMom something to be seen to be understood. Watch our video interview below to see what we mean. 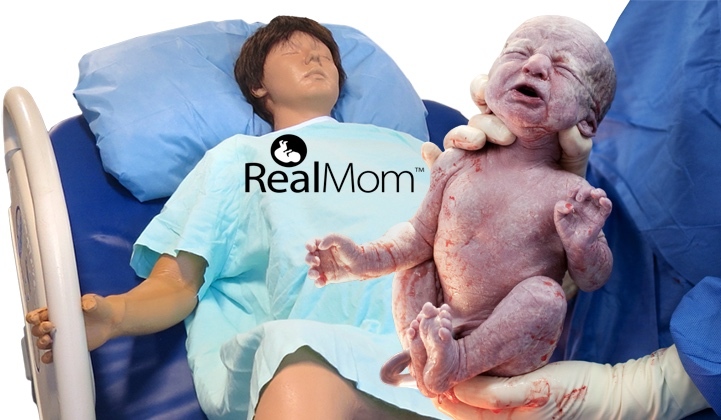 Lifelike Mother and Baby: Full-body birthing simulator and full-term baby with unsurpassed realism and lifelike appearance. Features realistic, soft tissue and accurate internal anatomy. Available in Caucasian and African American skin tones. Natural Delivery: First-in-the-world, natural delivery with active, soft tissue birth canal. Provides human-like dilation and effacement with massageable fundus and amniotic reservoir. Includes a fully-realistic uterus, placenta and umbilical cord. Fully Operable: Provides normal delivery, breech, shoulder dystocia, nuchal cord, cord prolapse, transverse and placenta previa, compound delivery, and assisted delivery with forceps or vacuum devices. Postpartum Hemorrhage: Realistic postpartum hemorrhage control with appropriate flow control and the ability to effectively stop hemorrhage with a Bakri or Ebb balloon. Tablet Control: Instructor control of dilation and delivery progression. Physiological presentation and control of maternal and fetal heart rate, fetal heart tones and contractions, pulses, blood pressure and SPO2. Supports iOS, Android and computer browsers. Simple and Affordable: More affordable than other competitive birthing simulators and with no complicated programming or set-ups there’s no simulator downtime. RealMom can be operated remotely using an iOS or Android device or any standard computer browser. The ICI software requires very little programming or set-up and provides instructors with an intuitive and easy-to-use interface for control of: Dilation and delivery progression, Contractions, Shoulder Dystocia, Heart rate and tones, Respiratory rate, Blood pressure, temperature, SPO2 levels, and Postpartum hemorrhage bleeding. Learn more about the RealMom on the Operative Experience website today!